Known by older members of the community as Clough Road, this is a cul de sac that starts by the Crown Inn at the end of Church Street and continues for half a mile to Waulk Mill waterfall. A stone paved footpath continues across the fields to Rainow village. Leads to Dyers Close, Mill Lane (pedestrians and horses only). Nearest pubs – Crown Inn (at the start of the road), Poacher’s Inn (via Mill Lane). Council Ward – From Church Street to the bowling green, East; from the bowling green to the end is actually in Rainow parish. (In 2017 the bowling green was awaiting planning permission for redevelopment as houses). 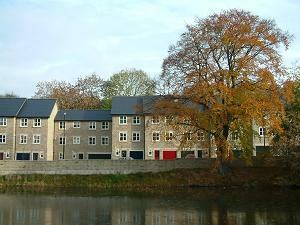 Ingersley Vale passes first between the Higher Mills mill pond and a row of new houses built by Linden Homes (pictured above), then onto a narrow road and over the boundary into Rainow parish, to a small community of a pair of semi-detached farm houses and four cottages all in stone. There is more about Higher Mills on the Dyers Close page. Behind these is the site of Rainow mill recently occupied by McNulty’s glass works, now a joinery, and an engineering works. In front of the cottages is the junction with Mill Lane, suitable only for pedestrians, bikes and horses. Once past the mill the valley becomes deeper and very narrow. The waste ground to the left is the filled-in site of the mill pond. Here is also the entrance to the back of Ingersley Clough mill, now closed off and derelict, being prepared for redevelopment. The single track road passes to the right of the mill; it goes up and over a hump and down once again to the valley bottom. As you walk over this hump look up to the right and see the mill chimney standing in the field above (left). There is a tunnel under the road and up the hillside which once took the smoke from the boilers to the chimney. A little further see the aqueduct high across the road. This fed water from Clough Pool above the waterfall along the leat into the wheel house – read more on this below. 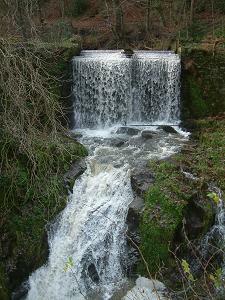 The impressive waterfall marks the lower end of Clough Pool, a mill pond for Ingersley Clough mill. Today this pond is almost totally silted up with just the stream running through it. The silt has built up to such an extent that trees grow on it – in fact the first generation of trees have already died off. The pool is now privately owned and being maintained as a nature reserve. There appears always to have been a natural waterfall here. Only the top vertical part of the fall is man-made – necessary to create the pond behind. The water runs away beneath a fine stone bridge and through the rocky gorge out into the valley behind Waulk Mill Farm house. This fall, of course, provided the valuable head for the mill lower down the valley. The water was carried to the mill along the hillside in a leat which is still visible. It is underground in front of the cottages but in an open ditch at the top of the field. At the mill it crosses the road in the small iron aqueduct and fed the wheel that used to be mounted in the big wheel house at the side of the mill. The wheel was about 56 feet in diameter, the largest in mainland Britain – only that at Laxey in the Isle of Man was larger. There is more on this on the Ingersley Clough mill history page. 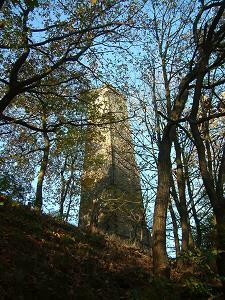 White Nancy monument ; II, Folly/summerhouse: 1817 for John Gaskell jr. of North End Farm. Accessible from local roads via public footpaths. Ingersley Clough mill is not listed.